One of the most famous and popular stops on the way to Everest is a village called Namche Bazaar, which is located at 11,286 feet (3440 meters). Most trekkers reach Namche on their second day of hiking, but to get there they must first conquer a very long, and challenging hill that is a test of stamina for just about anyone. In fact, that day on the trail is one of the most challenging of the entire trek, as you gain more than 2600 feet (800 meters) in altitude. Fortunately, nearly everyone who makes the trek ends up spending an extra day in Namche, giving them a chance to rest, acclimatize, and explore the place further. Nestled along the crescent shaped slopes of the Khumbu Valley, Namche Bazaar is both charming and exhausting all at the same time. The narrow alleyways are lined with gear shops and teahouses, but you’ll have to climb more steps than you’d care to count just to visit any of them. It is especially disheartening when you arrive in the village after 3 or 4 hours of climbing, only to to discover that the lodge that you’re staying in happens to be on one of the upper tiers, and you’ll have to climb yet more stairs just to get to it. Luckily, Namche has some of the most comfortable and inviting teahouses in the entire region. You might even get a warm shower (for an extra charge!) and a TV in the common room. 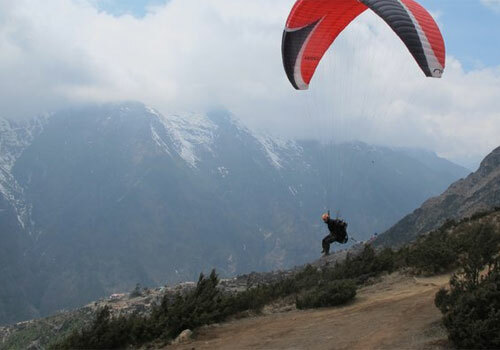 With a population of roughly 1500 people, Namche is the largest town in the Khumbu Valley, and as such, has a number of amenities that you won’t find as you go higher. For instance, there is an actual bank in Namche, not to mention a police checkpoint, and a karaoke bar. Internet cafes are common as well, although I’m pretty sure they measure their connection speeds in terms of “baud” and not “megabits”. That population in Namche swells dramatically during the spring and fall trekking seasons of course, with backpackers and climbers flocking to the area in droves. It is not uncommon to hear a half dozen languages being spoken while you stroll the cobblestone streets past the numerous gear shops, and if there is anything that Namche has an abundance of, it is gear shops. If you’re a few days into the trek, and you find you’re in need of some piece of gear, then chances are you can find it in Namche Bazaar. Whether it’s boots, sleeping bags, or warmer clothes, you’ll find everything you could possibly need, often at excellent prices. Some of the gear is authentic, some are cheap knockoffs, but the village is an outdoor gear lovers dream come true, and while it is possible to resupply on some items later in the trek, everything gets more expensive the higher you go. As I mentioned, you’ll actually spend a “rest day” in Namche to help you get use to the altitude and give you time for a bit of recovery. But that doesn’t mean that you’ll be taking it easy while you’re there. In fact, on my second day in Namche, my trekking group was up bright and early, as usual, and after breakfast we were on our way up a nearby mountain to continue working on our acclimatization. On that morning climb we actually went up an additional 1300 feet (400 meters), and got our first views of Everest, Lhotse, and one of the most beautiful mountains on the planet, Ama Dablam. With our acclimatization climb out of the way, we were back in Namche by lunch time, and had the rest of the afternoon to spend at our leisure. Most of us took it easy, taking a nap, curling up with a good book, or playing cards in the lodge’s common room. Namche is the first part of the trek where altitude sickness begins to become a real concern, and it is important that you not only work on acclimatizing, but also get plenty of rest. You’re also burning a lot of calories on the trek and expending a lot of energy, therefore you’ll spend your rest days eating plenty of food and drinking lots of water as well. Before long, your stay in Namche is over, and you’re back on the trail to ever higher, and ever smaller, villages. Each has their own unique character and each brings you one step closer to your ultimate goal – Everest. But when you depart Namche, you truly feel like you’re stepping into the High Himalaya and moving into more remote territory. The first few days are just a warm up for the adventure that is just ahead.